The Ministry of Natural Resources to present a state program for a 25 percent increase in Russia’s oil and gas reserves. Russia’s energy reserves will increase by one quarter over the next seven years, according to the goals of a Ministry of Natural Resources draft program for the replenishment of natural resources. Around $98 billion will be spent on exploration and development. Experts estimate that Asia and South America will provide demand for the resources. The Ministry of Natural Resources has drafted a program for the replenishment of natural resources for the years 2013-2020. Natural Resources Minister Sergei Donskoi presented the program to the open government on Tuesday, Feb. 26, with the Cabinet scheduled to consider it shortly afterward. The document focuses on the replenishment of the mineral resource base and the exploration of subsurface resources. In particular, it spells out financing for exploring the continental shelf. “The nation’s mineral resources remain the basis for funding Russia’s budget and maintaining the country’s export potential,” the ministry stated in a brief. And so they will remain: global demand for key commodities is set to grow at least through 2030, driven mainly by Asia and South America. According to general estimates by analytical agencies that are relied upon by the ministry for its own projections, demand for oil will grow by 14 percent, demand for natural gas by 36-52 percent, demand for ferrous and non-ferrous metals by 30-45 percent, and demand for rare-earth metals by 30-35 percent. Russia’s deposits are becoming depleted, however, as almost 60 percent of its fields contain just 0.3 million tons of recoverable reserves each. Less than one percent of deposits contain reserves in excess of 15 million tons, with geological exploration and production activity moving into remote areas with undeveloped infrastructure. The Ministry of Natural Resources is proposing to turn the situation around by spending $98 billion (3 trillion rubles) on replenishing natural resources. According to the ministry’s estimates, those investments should increase the value of the key subsurface resources at global market prices by $5.6 trillion (173 trillion rubles). This will also increase budget revenues from the mineral resource extraction tax — as well as from other direct levies on the use of resources — by 35-40 percent. An increase in reserves will help offset the production of the key resources. For instance, oil reserves should grow by 6 billion tons (Russia’s discovered recoverable oil reserves are currently estimated at 25.2 billion tons), natural gas by 12.6 trillion cubic meters (445 trillion cubic feet), coal by 7.12 billion tons, uranium by 106,000 tons, iron ore by 1.6 billion tons, and gold by 4,070 tons. 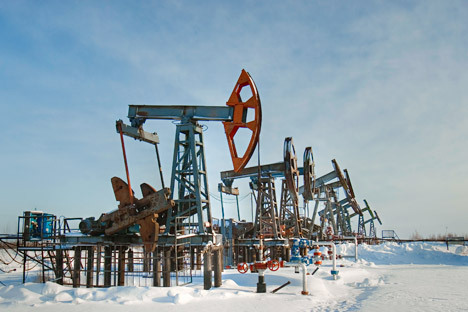 Rustam Tankayev, a leading expert at the Union of Oil & Gas Producers of Russia, said that boosting reserves by the volumes announced by the Ministry of Natural Resources was feasible. “But, as far as natural gas is concerned, building up reserves and output only makes sense in certain regions that lack their own gas, such as Timano-Pechora or Tatarstan,” he said. According to Tankayev, gas reserves discovered to date (around 50.2 trillion cubic meters) are already in excess. An increase in reserves will help boost production to 1.3 trillion cubic meters annually. “At the same time, Russia is having trouble selling the 600 billion cubic meters it produces now,” said Tankayev. This mainly has to do with Gazprom’s declining exports to Europe. Russian natural gas is the most expensive in Europe (the average selling price last year was $402 per 1,000 cubic meters), and European customers are trying to cut down on consumption. This is especially true for Ukraine, which has lowered its order from 52 billion cubic meters under the original contract to 20 billion cubic meters. Geological exploration in Eastern Siberia is performed exclusively by state-owned companies, because operations in that region are still unprofitable. Still, the Eastern Siberia-Pacific Ocean (ESPO) oil pipeline needs to be filled with Eastern Siberian oil (at present, it mostly carries oil from Western Siberia, exacerbating transportation costs). Eastern Siberian oil now accounts for only 35 million tons of the ESPO’s 80-million-ton capacity. Tankayev was skeptical in his assessment of the outlook for offshore hydrocarbon exploration, pointing out that not only Russian but also global oil companies lack safe offshore production technology. The Oil & Gas Center research director at Ernst & Young Moscow, Denis Borisov, also noted that, in terms of proven reserves, Russian vertically integrated oil companies are far ahead of global public majors. While the average reserves-to-production ratio of Russian companies is 22 for all oil and gas reserves, and around 19 years for liquid hydrocarbons, the global numbers are 13 and 12 years, respectively. Moreover, the combined hydrocarbon reserves of Russia’s five largest vertically integrated oil companies, which are responsible for more than half of Russia’s total output (Rosneft, LUKoil, TNK-BP, Gazprom Neft, and Tatneft) have grown by around 5.5 billion barrels of oil equivalent (10 percent) since 2009 — up to approximately 59 billion barrels of oil equivalent.